All of the guestrooms feature plush Hyatt Grand Beds and state-of-the-art media and work centers. 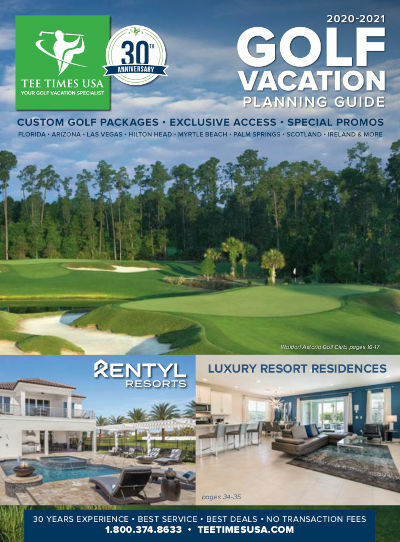 Tee Times USA guests will love the 42' HDTV, Cozy Corner with sofa or sofa-sleeper, and bathroom vanities with granite countertops and complimentary amenities. Get connected with free Wi-Fi and remote printing. Forget something? Odds & Ends has you covered with must-have items you can buy, borrow or enjoy for free. Start your day with a complimentary hot breakfast served daily with hot breakfast items, fresh fruit, oatmeal and plenty more to choose from. After a day of golfing, take advantage of the complimentary 24/7 gym with Life Fitness Cardio equipment or relax in the Coffee to Cocktails Bar, serving specialty coffees & teas, premium beer, wine and cocktails. Three nights accommodations at Hyatt Place Orlando/LBV in a standard room based on double occupancy. One morning round on Grand Cypress with power cart. $15 credit at Shingle Creek, Grand Cypress and Ritz-Carlton for lunch at their clubhouse grill. * This $489, 3 night / 3 round package special is based on a trip May 6 - May 9, 2019. * 3 nights accommodations at the Hyatt Place Orlando/Lake Buena Vista in a Standard Room Queen with two beds and a pull-out couch, based on double occupancy.